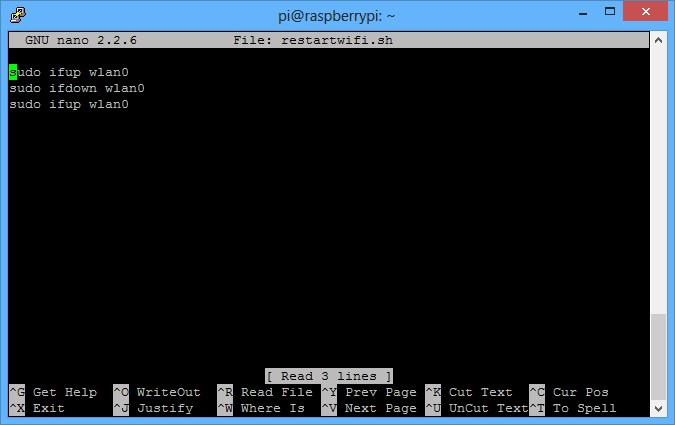 When I first bought my Raspberry Pi, I had this problem. My router and TV are in different rooms and I don’t have a ethernet cable. This restricts networking ability of my Pi which is quite annoying. I searched for articles on assigning static IP addresses to Raspberry Pi but most of them were talking about assigning it for eth0. I, on the other hand wanted wlan0 static IP. Press Ctrl + O to save. Now, I am aware that this script can be improved but this is what I had before and it has worked without any problems. Press Ctrl + O to save the script. Then press Ctrl + X to exit. If you’re not root, you’ll have to prefix above command with “sudo”. If you’re in putty session, you’ll immediately go offline. If you’ve done everything correctly, you should be able to ssh into your Pi, after couple of minutes, on your chosen IP address.